Entering Bolivia overland is like travelling back in time. The main cities are horribly overcrowded and polluted. However, venture out in the wild and you’ll experience a way of life time has forgotten. Here the people don’t live ‘underdeveloped’ but live more inline with nature and the environment. Geographically, Bolivia can be split into two regions, the High-lands and the Low-lands. The High-lands are home to the big tourist places in Bolivia. Uyuni Salt Flats, La Paz, Sucre and Lake Titicaca. But, if make your way down the rolling valleys towards Brazil, you’ll find some stunning scenery, amazing cultures and the friendliest people. This ‘middle ground’ was my favorite part of Bolivia. Money	 The Bolivian Boliviano is relatively stable and is easy to withdrawal with international cards. Bolivia is one of cheapest country in South America. Accommodation	 Accommodation options are plenty in Bolivian tourist hot-spots. Hostels will mostly only be concentrated in cities. Couch-Surfing is not as popular as say Chile or Argentina. Wild camping (outside main cities of course) is possible with common sense. Food	 Food is basic in Bolivia. Motorbike Parts (Availability, cost of Adv Bikes Parts)	 Possible in Santa Cruz de la Sierra. Most parts should be available there. Same as servicing options. Petrol (Accessibility, Cost and Quality)	 Bolivia has a two-tier fuel prices. One price for locals and on for everyone else. The local price is based on if you have a Bolivian number plate. Since you probably don't there are two approaches. You can either accept the price they give you. (it will still be cheaper to pay the tourist price in bolivia than most other places around the world). Or you can ask for the local price. The answer will depend on the person at the pump. Remember the local price is subsides by the government because of the wages in Bolivia. I'd recommend not force the issue of trying to get cheaper fuel. If they give you a the local prices, great, if not smile and pay the 'normal' price. Fun Factor on the Road (Did the roads put a smile on my face)	 Bolivia has some of the best trail rides in South America. Since car ownership is low here, you can expect to have to roads all to yourself. Check out my section on Epic Rides in Bolivia. Also note, if you happen to run into roadworks, expect massive delays. up to 5 hours! Internet (Wifi Access / Local SIM Usage)	 WiFi access in Bolivia is limited. I'd recommend buying a SIM card. Entel has great coverage. Spanish. But also Quechua, Aymara, Guaraní. Spanish is spoken more neutral making it easier to understand than say Chile or Argentina. Sucre is a great place to take Spanish classes. Bolivia is relatively safe. Big cities have areas that should be avoided. Any seasoned traveler will have a sense of these areas and should avoid flashing expensive items around. Theft/Pick Pocketing is common like most places in Latin America. 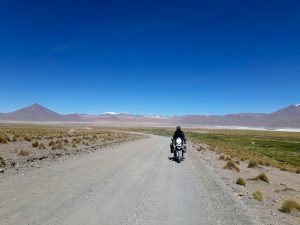 Riding Bolivia is amazing. There are barely any highways. Traffic is minimal between cites and towns. The roads are mostly not is great shape. So don’t rush, take your time and enjoy a slower place to Adventure riding. For bike servicing and repairs, you’ll find everything in Santa Cruz de la Sierra. This Epic Ride is between the High and Low lands of Bolivia. Remote dirt roads, rolling lush green valleys, soaring condors and friendly villages dominate the route. As of 2018, loose hard packed gravel. Because it is a mountainous road, it may become impassable during heavy rain. Some river crossing. La Higuera lies at an elevation of 1950m, with a population of around 100 people. The village became famous in October 8, 1967 when Che Guevara was captured by the CIA-assisted Bolivian Army in the nearby ravine Quebrada del Churo, ending his campaign to create a continental revolution in South America. Che Guevara was held in the schoolhouse, where he was killed the next day. The body was then brought to Vallegrande, where it was placed on display and afterwards secretly buried under an airstrip. The village is tiny and consists of only a school, main square and now two hostels. The whole village has several statues and monuments to Che. La Pajcha is a lovely waterfall just off the road to Samaipata. It’s definitely worth a stop for a break after tackling the crazy roads. Samaipata is place you quickly fall for. It’s a small town in valley that has a great climate and a good mix or locals and expats. Check this separate post. Let’s start with an overview. Like most places outside the cities in Bolivia, this route is remote and the roads are dirt and gravel. You won’t see many other vehicles on the road. This area was my favorite in Bolivia as the climate is mild and the rolling green valleys provide some stunning backdrops as you ride. The scenery is stunning. However, based on the weather, your visibility could be limited to white cloud meters in front of you or lust green valleys as far as you can see. This ride is also part of the “Ruta del Che” (Che Guevara Trail). check out my vBlog of the Route below. 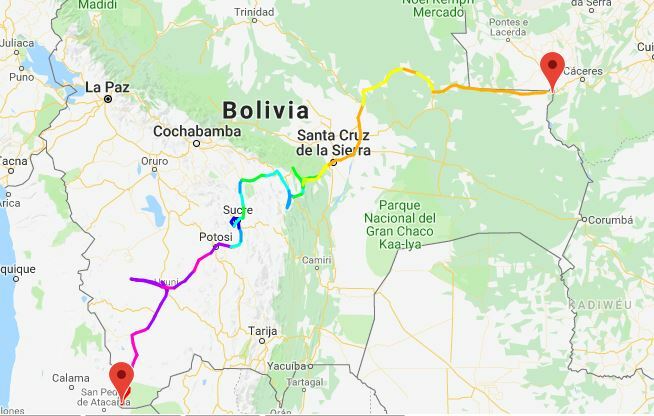 This ride starts in either Bolivia or Chile. This Pass, as the name suggests, travels via numerous Lagoons. Sounds ok right? Well it is and SO MUCH more. 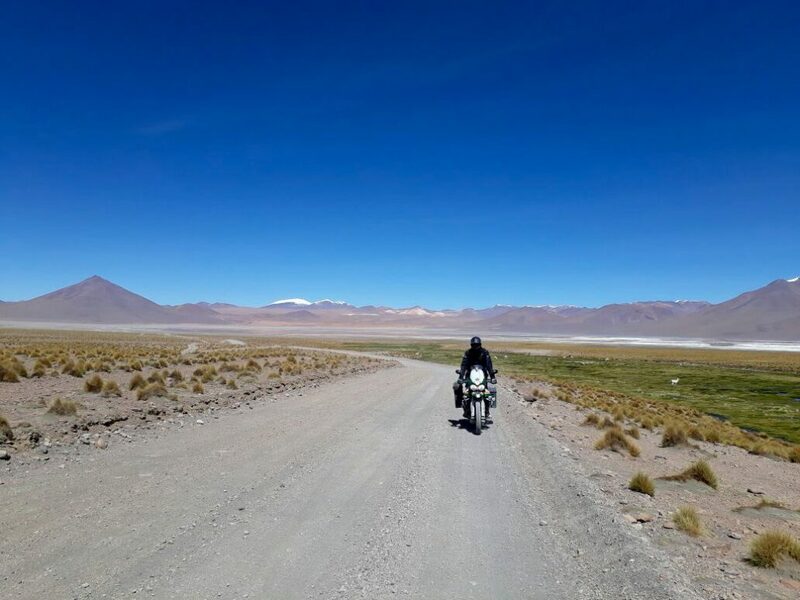 This Epic ride starts from either Chile, Bolivia or Argentina. As of 2018, loose hard packed gravel and some sand. Let’s start with an overview. This area is the most isolated in Bolivia, maybe the world. 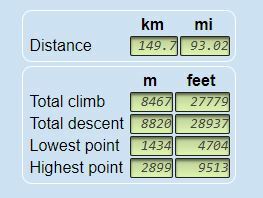 As you can see above, the elevation profile for this ride is high. Very high. Straight up we need to discuss planning for this route. This pass will only be passable in summer months. Of course there are variables in weather, so check before attempting this route as it takes a few days to complete. The scenery is stunning. The roads are difficult and will test your riding skills. The altitude is high, you’ll be out of breath. But once you make it back to civilization, you’ll be smiling ear to ear.